Toyama Prefecture (富山県, Toyama-ken) is a prefecture in the Chūbu region of Japan on the island of Honshū. The capital is Toyama. The area of Toyama Prefecture comes from Etchū Province. The Itai-itai disease, whose origin is from polluted water with cadmium, occurred in Toyama around 1950. 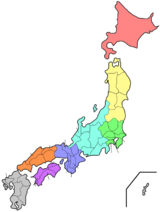 Toyama Prefecture is bordered by Ishikawa Prefecture to the west, Niigata Prefecture to the northeast, Nagano Prefecture to the southeast, Gifu Prefecture to the south and the Sea of Japan to the north. ↑ Nussbaum, Louis-Frédéric. (2005). "Toyama prefecture" in Japan Encyclopedia, p. 991; "Hokuriku" at p. 344. ↑ Nussbaum, "Toyama" at p. 991. ↑ "Nationwide List of Ichinomiya," p. 2; retrieved 2012-8-28. This page was last changed on 31 August 2017, at 13:51.